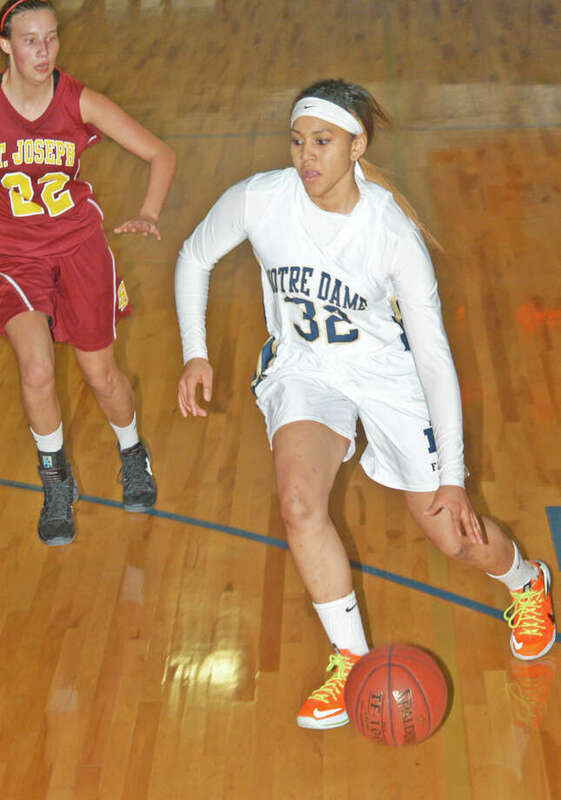 Briana Mann, of Notre Dame-Fairfield, drives against St. Joseph on Monday, Dec. 30 in the championship game of the 20th Annual Notre Dame Catholic High School Appalachian Classic Basketball Tournament on the Lancers' court. They lost to the Cadets 48-23. Mann was named to the all-tournament team. Visiting St. Joseph made the Lancers girls work for everything they got in the championship game of the 20th Annual Notre Dame Catholic High School Appalachian Classic Basketball Tournament on Monday night in Fairfield. Unfortunately, for the Lancers, not many of their shots went in and the Cadets pulled away for an easy 48-23 win. Notre Dame, which defeated eventual tourney consolation game winner Thomaston on Friday night, fell to 1-3 this season. St. Joseph, of the FCIAC, improved to 3-3. The Lancers, of the SWC, got 10 of their points from the free-throw line where the team had 16 chances. St. Joseph jumped to a 16-7 lead after one quarter of play. Both teams managed just four points in the second period. By the end of the third, the Cadets turned a 20-11 halftime advantage into a commanding 33-18 cushion. "They came out of the gates pretty well. We didn't match their intensity at the beginning," Notre Dame senior Alexandra Danas said. Things remained somewhat close early in the third quarter. Notre Dame's Raina Ceryak, a sophomore, hit a pair of free throws midway through the third to pull her team to within 24-16, but the Cadets proceeded to go on a 7-0 run ended by a couple of free throws by Dayniera Artis, who came up with a steal and was fouled on a layup attempt. The Cadets had a 15-2 run from the start of the third quarter into the middle stages of the fourth. The Lancers didn't get their first field goal of the second half until Kayla Croswell's layup with 5:30 left in the game, which made it 39-20. All seven of the Lancers' third-quarter points came from the foul line. "It was just one of those nights when none of our shots would fall -- including layups," said senior Briana Mann who, along with Croswell, was named to the all-tournament team. Croswell dropped in 11 points to lead all scorers, and St. Joe's got a balanced scoring attack, led by 10 from Most Valuable Player Shannon O'Meara. Cadets coach Chris Lindwall believed his team made some good adjustments at halftime, noting the Cadets sought out to pick up on Notre Dame's pick-and-rolls, finish scoring chances inside and play together better as a team. "Our kids got focused on what we needed to do," Lindwall said. "The kids executed -- they earned this one." "They did a nice job defending our pick-and-roll," Notre Dame coach Eric DeMarco said. "They did a nice job controlling the defensive glass and limiting our second-chance shots." DeMarco said that while there was no denying that his team had a poor shooting performance, some of the credit should go to St. Joseph for playing tight defense. The Lancers will have another difficult challenge in front of them in their next scheduled game with South-West Conference foe and one of the state's stronger teams, Lauralton Hall of Milford. That game is on Friday, Jan. 3.